Let me start off by saying this is my first time doing a review so bear with me. Most of the rifles I have are springers. I had gotten my wife a Gamo Big Cat and she struggled with it and hated it. It was to serve 2 purposes. At which point it did neither for her. Another story and I digress. I picked this rifle up for $300 at a sporting good shop. I'm friend with the owner and he gave me a deal. I't's a 10 round rotary magazine fiber, optic sits and comes with A 3x9x40 scope. The most intriguing thing about the rifle was that it was a pump action. So you pump the forestock to advanced the next round. Much like a pump action shotgun. The estetic of the rifle is very appealing. the only thing is the sights. They will take some getting used to. There is a very wide wedge in which to line up the front sight into and both sit up fairly high. The manual that comes with the rifle shows you how to line it up however it still leaves lots of room for error. The rifle come with a fluted heavey barrel which will help with accuracy of shooting. High comb stock which will assist smaller shooters align eye with the scope. All metal receiver. Push button safety. Putting on the scope is the way to go of course. The scope gives you a very bright and crear sight picture nad lots of options. The monting unit is very sturdy and nothing to laugh at. This is not a flimsy unti that is going to fall apart and let the scope flop around. Mounting the scope took me all of 5 minutes and allen/torx wrenches were supplied. To load up the co2 was very easy. The front for stock comes off by squeezing 2 tabs and the stck slides forward and off. Then it's a matter of screwing the co2 in. Putting the forstock on however takes some getting used to. Everything needs to line -up and click into place. took me several times to get that right. Loading the rifle involves "Wracking" the slide towards the receiver till it stops. then sliding a switch back removing the magazine loading it with the 10 rounds. Putting it back. pushing the switch back so it ceners it. "Wrack the slide forward". You're good to go. Now the moment of truth. My experience with co2 is from the eighties and paintball so a bit skeptical. Using Gamo TS-22and Stoeger x-field i sighted in the rifle in 8rounds at 35 yds. Then the accuracy of this rifle came out. My wife fell in love with the rifle. At 35yds she was putting all her shot sthin at loonie. First time shooting the rifle and it was going through 3/4 inch OSB. The FPS is 650. This rifle is a hard hitter as i could hear it hit the OSB and hit the wood behind it. I'm deaf. Didn't get a chance to go out further. That's going to be next time. My wife is planning to take this rifle out prairie chickien hunting in the next couple of weeks. The only Issue I see with this rifle is for thos who want to modify it. The pump action is going to get in the way of that. I hope this help. If you have any questions. Please pm. Nice job, Sean. You didn't mention calibre and pellet weight, but at 650 fps, I'd guess that 35-40 yards would be reaching the limits of this rifle as a chicken plucker. 88-gram carts, I presume? Good candidate for HPA. In all my info I forgot the caliber. Sorry, It's a .22 caliber. Definite hard hitter. like I said it was punching through 3/4 inch OSB with ease. Wife fell in love with the rifle and plans on hunting the dreaded prairie chicken with it. 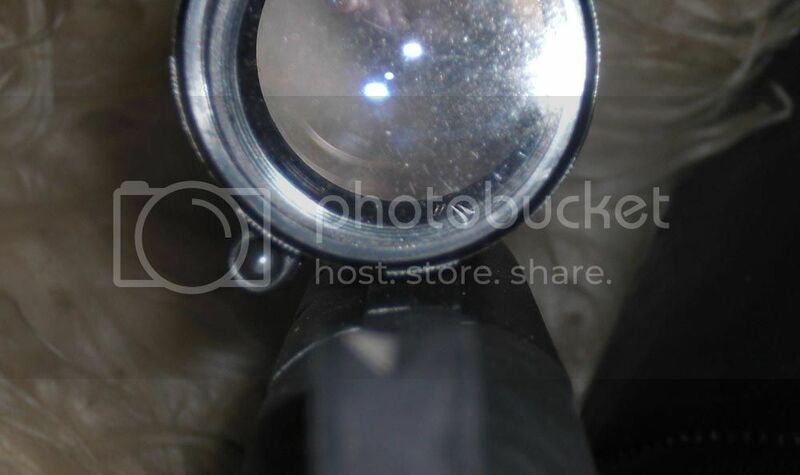 I tried to show how high the rear sight is with the one picture but it didn't turn out.